Have just returned from another cycling trip to a Meditteranean island. Last year it was Sardinia. This year Corsica. Myself and my brothers journeyed around the coast from Bastia to Ajaccio. Despite 2 days of very heavy, west-of-ireland style rain, we had an excellent time. 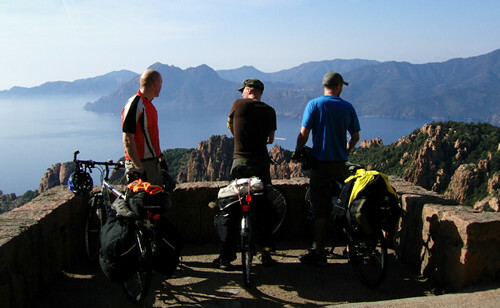 (A photo of me (middle) with 2 of my brothers overlooking the magnificent Corsican coast is shown below.) In comparision with Sardinia, Corsica is very mountainous. This meant lots of climbing uphill and wonderful freewheeling descents. The highest ascent was 1,101 metres (higher than Carrauntuohil, Ireland's highest mountain).